The Moon and You is a cello/guitar duo that marries over 20 years of combined experience as professional musicians with warmth, originality and a respect for tradition. Our extensive repertoire of original and cover songs runs the gamut from classical to vintage/romantic, bluegrass and classic country to contemporary indie and classic rock. We put our own sweet stamp on every song we play, and we approach every client and every gig with the utmost professionalism. Rooted in the rich music scene of Asheville, NC, seasoned players Ryan Furstenberg and Melissa Hyman have been working together as a duo since January of 2012. In that time we have given many hundreds of performances at weddings, events, festivals, retirement communities, theaters, clubs - almost any sort of venue you can imagine. Our wedding clientele in the Asheville area is always growing, mainly by word of mouth / referrals. We often book quite far in advance, but don't hesitate to contact us about gigs that are coming up soon - we may have a last-minute opening in our calendar. The Moon and You “blends cello and guitar to craft folk music with a 1970's singer-songwriter feel in the vein of Joan Baez or Harry Nilsson. Together they make tender songs that feel like a warm homemade blanket,” says Brian Tucker of the Wilmington Star News Online. We travel throughout the Southeastern US, up and down the East coast, and to Western Europe; our touring territory is always growing, too. Ask us about your wedding even if it's a long way from Asheville, NC - often, we can work a far-off event into our tour schedule in order to make it possible. The stately elegance of cello, the warmth of fingerstyle guitar,and the gorgeous sound of two voices in harmony can add so much beauty to your wedding ceremony. Band members have won grammys, toured the world, and performed with the likes of KISS, Jimmy Page, Allman Brothers, Cheap Trick, Sammy Hagar and others. Orange Krush has performed at over 500 events in over 150 venues over the last 15 years, entertaining crowds all over Western North Carolina and the southeast at a variety of private events and parties. We use this experience to create a “MIXTAPE” of favorites that will pack the dance floor all night long! Our band proudly does not discriminate against anyone for any reason. We strongly believe in equality, inclusion, and compassion. We welcome all people with open arms, including our LGBTQ brothers and sisters! 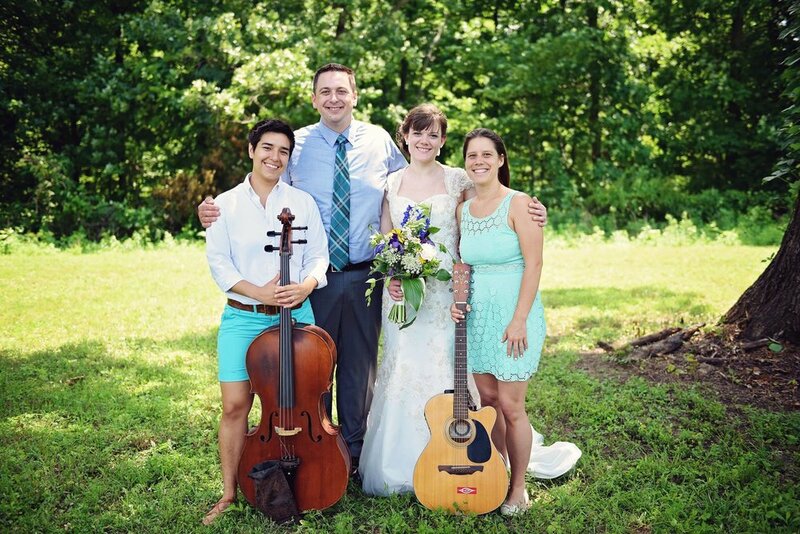 The Magills have over 25 years experience playing for weddings and other events, and are regular performers at The Biltmore Estate and The Grove Park Inn. Their music which consists of guitar, mandolin, Irish flute, silver flute and low whistles, has been featured on North Carolina Public Television, NPR’s Thistle & Shamrock, and NPR’s Mountain Radio Stage. Regarding their musical style, they play original and traditional music, rooted in the Celtic and Appalachian traditions, as well as light classical when preferred and requested. Jim is the founding Director of the Swannanoa Gathering Folk Arts Workshops at Warren Wilson College, and Beth plays with various musicians & bands, is a recording session musician and teaches Irish flute and tin whistle. Collins and Jordan are classically trained musicians who first toured together as part of Over Under Yonder, a five piece band that played songs from Collins’ debut album Journey Onward. Collins composed most of the songs that appear on Journey Onwardas she thru-hiked from Maine to Georgia on the Appalachian Trail in 2006. * We are able to bundle prelude, ceremony, cocktail hour, and reception entertainment at a special rate. Please give us a call today for a quote. Carolina Music Planner will be the central contact for booking, music selections/organization, and all communication.